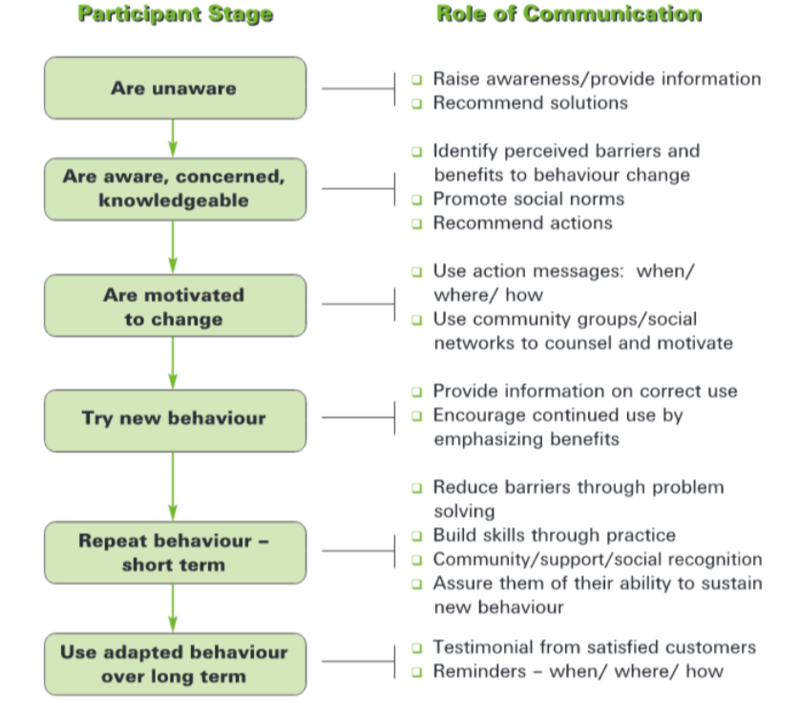 Chronological steps of behavioural change amongst information users (page 47 of the toolkit; World Bank/Cecilia Cabanero-Versoza, 1996). This comprehensive toolkit* defines goals for the issuance of early warnings, and creation of improved climate information products and supportive communications strategies. These supportive strategies serve to engage actors, build political support, engage the private sector and present a true value proposition to endusers. Using example case studies, the toolkit explores best practices, defines roles and expands on the tools that are necessary to create an integrated communications strategy. The toolkit continues with a step-by-step outline to create response protocols and issue early warnings, address challenges and opportunities, define messages and stakeholders, package early warning systems, and engage with individual media and other relevant actors. There is a communications strategy template and TORs template that can be used by projects and practitioners to generate integrated communications strategies. *Download the full toolkit from the right-hand column. This toolkit provides National HydroMeteorological Services (NHMS), policy makers, and media and communications for development practitioners with the tools, resources and templates necessary to design and implement an integrated communications strategy. These communications strategies include the effective issuance and packaging of early warnings as well as the creation of supportive communications products and outreach efforts that will support the long-term sustainability of investments in the climate information and services sector. While this communications toolkit is tailored to the specialized needs and political contexts of sub-Saharan Africa, it can easily be applied to other developing nations. Communications is cross-cutting and should be injected and leveraged at every stage of project implementation. Thoughtful and purposeful communication and advocacy can build in-house collaboration, foster knowledge sharing between nations, support technology transfer and build political support. Through the issuance of early warnings and improved climate and weather information – and the development of appropriate public service announcements on what to do when bad weather hits – integrating communications into the everyday activities of NHMS can save lives, support sustainability and build livelihoods. From page 38 of the report: communities impacted by flooding. What can we take from this strategy? What programme goals do you hope to achieve with your communications strategy? How can communication work towards achieving each of these goals? This should be carried out for both Early Warning Strategies and Climate Information. Who are your main end users (including current users and potential users)? How do these end users interact with information (ie. they are illiterate, they speak multiple languages, they prefer village councils to newspapers)? What are the climate and weather needs of these end users? Which of the above needs have not been met? What about those that have been met only partially? Who are the main actors that will help deliver information to your end users? A SWOT analysis of End Users should be carried out. What are your core products? What are the attributes of your product? What are the benefits to end users of your product? What is the key message or emotion you want your end users to feel? What are the main messages you need to reach your end users? How does information flow in the current system? Create a new information flow based on the diagram below. What channels can you use to distribute climate information and early warnings? Who are the main actors for these channels? Who will be responsible for the packaging, distribution and monitoring of climate information? What supporting/advocacy products do you need to achieve your goals? Who will create these products? Create a sample budget, outlining costs, timelines, deliverables. What are the metrics for success of new early warning and climate information products (ie. Early warnings will reach 80% of the population)? What are the metrics of success for communications products (ie. Number of views, actions taken, early warnings issued, people reached, direct engagement and feedback)? How will you communicate and monitor that success? Step by step guide to creating a new information flow for section 6: Early Warnings (from page 51 of the toolkit). UNDP CIRDA, 2016. Climate Information & Early Warning Systems Communications Toolkit. UNDP.